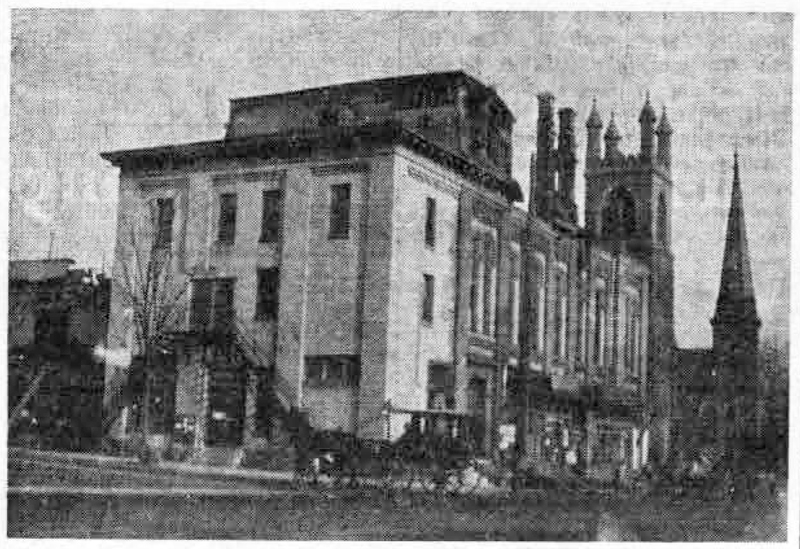 Although the picture shown above does not tell as graphic a story of the 1914 fire in Wayne’s old Lyceum Hall as do several others that have been used in this column, it is otherwise the most interesting picture shown to date of Wayne’s busiest corner 40 years ago. The horsedrawn vehicle, shown in the foreground of the picture, might well be called the forerunner of our present day station wagon, since a “wagonette” was a four-wheeled carriage designed for pleasure driving, with seating facilities for several persons. There were a number of them in use in Wayne for many years, and interesting examples of both those with a top and without one were shown in this column in April, 1949. The fire which created such havoc in Wayne’s largest business building broke out about 1:30 A.M. on December 30, 1914, gaining its start in the second floor of the Gas Company’s office, directly adjoining the old Opera House on North Wayne avenue. At that time the Radnor Fire Company had but two engines, which were quickly called into service. 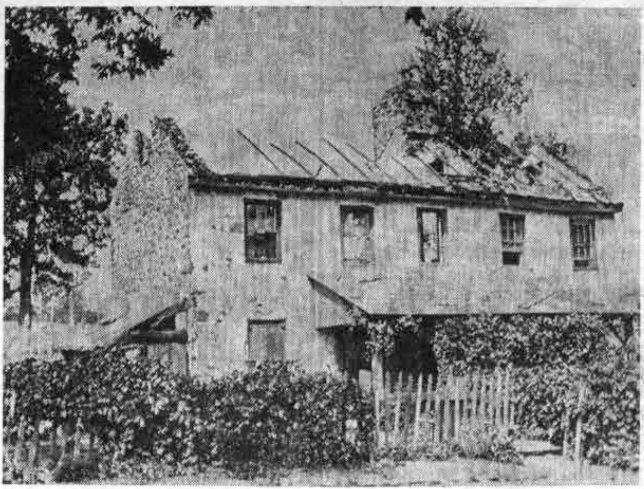 Otis Hunsicker, one of the old time firemen, tells your columnist that the first fire engine to be built by the Hale Fire Pump Company of Conshohocken was still in the shop, complete except for paint. So dire was the need for it that it was called into use just as it was, with Charles J. Young in charge of it. In addition, hurry calls were sent to Berwyn, Devon, Bryn Mawr and Merion No. 1. At one time eight streams of water were playing on the fire, the worst experienced in Wayne since the old Bellevue Hotel burned to the ground in March 1900. Losses from the Opera House fire were heavy, including $30,000 at the real estate firm of Wendell and Treat. In spite of the destruction wrought throughout the building, extensive repairs were soon under way, with tenants returning to their former quarters with little delay. The picture above shows the destruction wrought by fire on February 14, 1912, in the house then occupied by the George W. Hill family at 216 Walnut avenue. A notation on the original picture gives its origin as “hot ashes in outside shed.” Because of engine trouble, there was some delay in the arrival on the scene of Radnor’s two engines. However, they were soon joined by those from the Bryn Mawr Fire Company, who united their efforts with those of the local firemen to save whatever was possible. This included most of the contents of the house, except for some books and papers of Mr. Hill. Mrs. Hill, who was ill at the time, was removed to the home of a neighbor. After some hours of battling the flames the firemen left only to be recalled to the scene at 3 o’clock the next morning when fire broke out again. Except for the fact that the motor had been changed and a radiator added, the appearance of this first piece of motorized firefighting equipment, as shown in this column two weeks ago, is little changed. Those riding on the truck (left to right) are Ralph Robson, William Bryan, Jack Clark and Charles Watkins. The most gala day and the most tragic one in the 50-year history of the Radnor Fire Company are represented by the two pictures shown in today’s column. 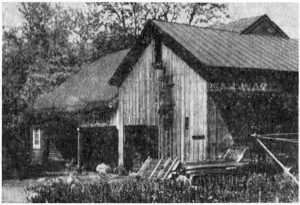 The first picture was taken on Saturday, June 10, 1911, when the Delaware County Firemen’s Association was in the second day of its two-day session, with the Radnor Fire Company as host. The second picture was taken on Thursday, April 3, 1930, when the Radnor Fire Company was among the first of those from miles around to arrive on the scene of the disastrous Devon fireworks explosion. But, before the Wayne siren could be sounded to call men and apparatus into action, the explosion had taken the lives of ten employees at the fireworks plant, among them four children under 16 years of age. It was the worst calamity ever to hit the Main Line. 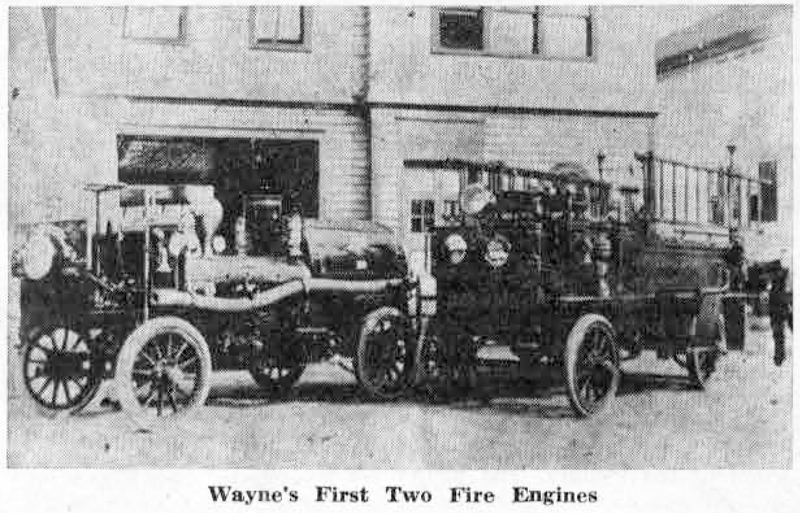 Seated behind the wheel of Wayne’s first Chemical and Hose Wagon on Saturday, June 10, was Paul Comins, with Charles Wilkins beside him. The men at the rear or the truck were flag bearers. At the time of this convention there were 29 member organizations in the Delaware County Firemen’s Association, the largest one-county organization in the entire United States. Most of these fire companies were represented in the big Saturday afternoon parade in Wayne, and many from other neighboring communities as well. Captain Leonard Haskett, of the Radnor Township Police Department, rode at the head of the procession, to the music of many bands, for its five-mile march “over the broad, beautiful shaded avenues of Wayne and St. Davids.” Immediately behind him rode and marched those visiting firemen who were not in the Delaware county district. Among these were 65 volunteers from Malvern, several of them drawing the hose cart of their company and accompanied by their 27-piece band. 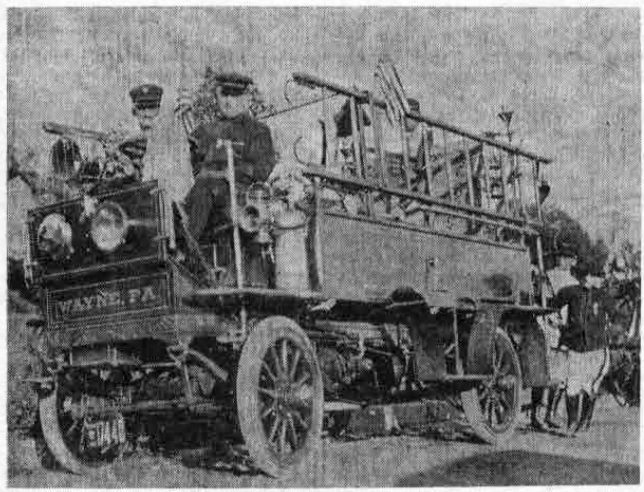 Other interesting participants in the parade were the Bryn Mawr Fire Company, with Fire-Chief Israel H. Supplee at their head and with their handsome steamer and combination truck. This first division of the parade also included, the “Darby Ram”, said to be the oldest piece of firefighting apparatus in existence anywhere. 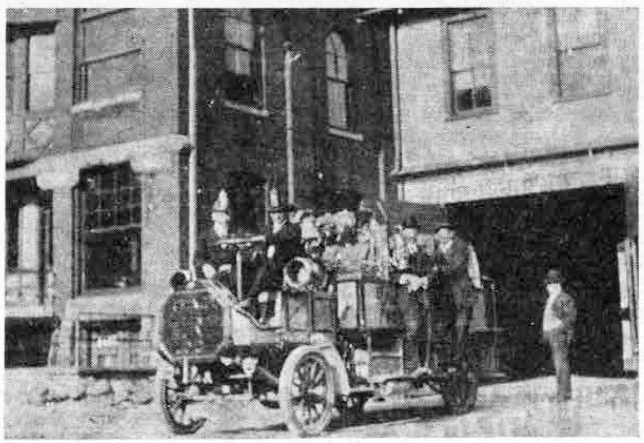 In great contrast to this was the new $7,000 auto truck of the Montgomery Hose and Steam Fire Engine Company, of Norristown, which made its first public appearance at this parade. The second division of the parade was made up entirely of representatives from the Delaware county fire companies. Darby was chosen to lead it, since its fire company is one of the oldest in the country. Clifton Heights had the distinction of having the only ambulance in the parade. Last in line was the Radnor contingent, with its 45 men dressed in their green uniforms, black gauntlets and shining black puttees. At the close of the march, which covered all the main streets of North and South Wayne, all bands, banners and apparatus were massed for a march from Louella avenue along Lancaster avenue to the Opera House corner, and thence to the school grounds, where refreshments were served. 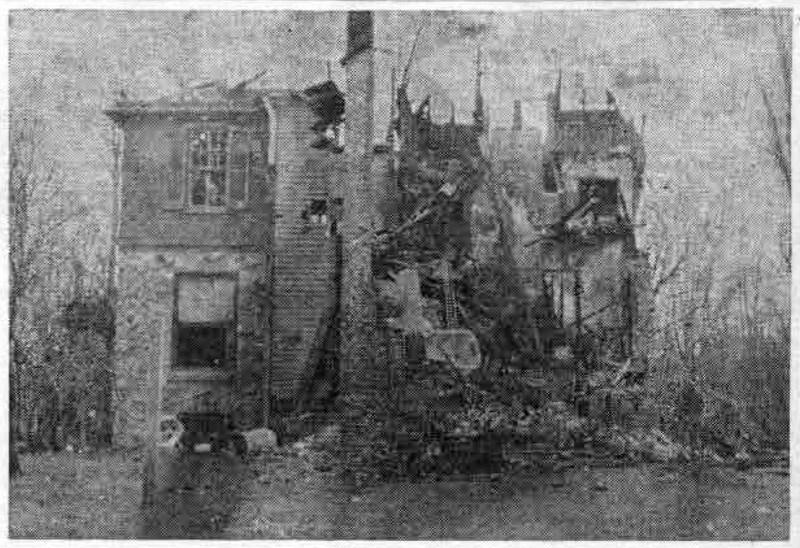 Not fire, but explosion caused the wreckage of this house on Devon Hill on April 3, 1930. It was but one of a number of small houses just across the road from the fireworks plant that were so badly damaged that they had to be razed to the ground afterwards. The largest individual property loss was to the Betner Paper Box Company (now the Betner Division of Continental Can Company) about a quarter of a mile distant from the explosion, where the entire interior of the plant was wrecked and 40 employees were injured. Other buildings that were severely damaged were the office of the Lobb lumber yard and the show rooms of the Packard Motor Company. Mrs. Charles M. Lea’s residence in Devon was damaged to the extent of about $50,000. The immediate cause of the explosion was probably known only to a few of the many victims of this great tragedy. The plant had long been a community menace with its large quantities of black powder and other explosives stored on the premises. Unbelievable as it may seem, gas stoves were used in heating the plant and there were also gas jets in the drying room. At the inquest, the Coroner’s jury gave one or more or these factors as the probable cause of the explosion. Fire companies from the entire general vicinity made record runs to the scene, with Radnor among the first to arrive. Once there they repeatedly risked their lives in the inferno of blazing fireworks. While the actual fire was confined to the plant itself, scattered debris started numerous field fires to add to the difficulties of the firemen. And once the fire was under control the work of clearing the grounds of explosive material had to be done by men especially qualified for the work. The fireworks plant was never rebuilt. The cleared area is now the site of numerous small new homes which are reached by taking a right hand turn onto Conestoga road just west of the overpass of the P & W railroad on Lancaster Pike In Strafford. The first picture used in today’s column shows two pieces of motorized fire equipment that might well have their places of honor in some national museum had they been preserved for posterity. The Knox combined chemical and hose wagon at the right, which was purchased by the Radnor Fire Company in 1906, was the first piece of motorized fire fighting equipment to be put into operation in the United States. Only one relic or this first fire engine has been preserved, the bell which was once attached to the front to warn all traffic of its approach. It now hangs on the wall of the upstairs assembly room of the fire house, where it is sounded to call fire company meetings to order. The truck at the left is the first motorized pumper to be put into operation in the United States. It was the Knox-Waterous automobile gas-engine of the two-cylinder, air cooled type. It arrived in Wayne and was tested out in April, 1908. The two pieces of fire fighting equipment were the beginning of the Radnor Fire Company’s present efficient set-up. The picture of the fire house as it looked in the early days is particularly interesting, showing that the left hand portion, where the engines were housed had a wide rear opening as well as a front one. Thus the engines could be driven out either onto the field at the rear or onto Audubon avenue at the front. 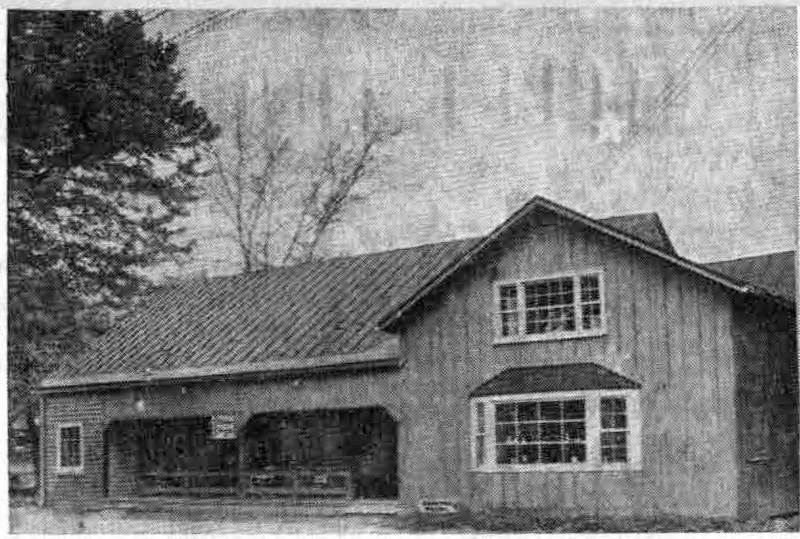 This building was later moved backward from its original location and an addition was built to the front. 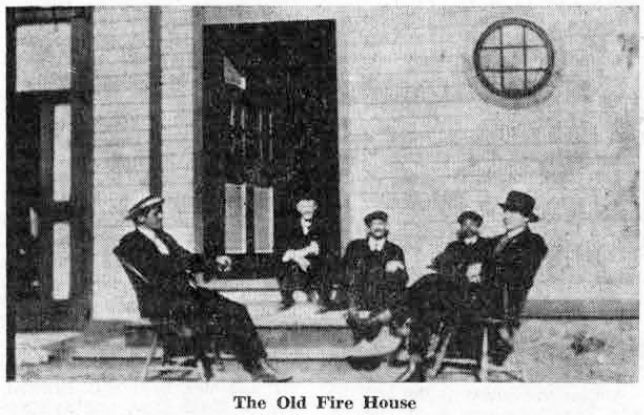 This picture, taken more than 45 years ago, shows several old timers seated in front of the fire house. They are (from left to right), William Bryans, Jack Clark, Charles Wilkins, Ed Holmes and Ralph Robson. Mr. Wilkins, father of Leslie Wilkins, one of the most interested and active members of the present fire company, was at one time the Fire Chief. 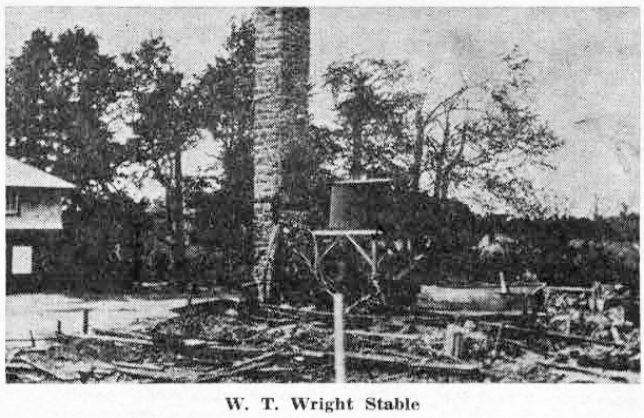 In May, 1912, a devastating fire occurred in the stable of the William T. Wright estate, located in the country south of Wayne. Due to a mistake in sending out the alarm from the Wright home, the fire had almost an hour’s start when the firemen arrived in the early hours of the morning. Realizing that the stables were beyond saving, the firemen worked heroically on the other buildings. Speed was important, in order to keep the flames from the garage, where a large quantity of dynamite was stored as well as boxes of fulminating caps and fuses. And in addition there was a large tank of gasoline under the floor of the building. Tons of water were thrown on the blaze by the combined force of the Radnor and Bryn Mawr fire companies, their source of supply being a 36,000 gallon reservoir recently constructed on the Wright property. Dense smoke and intense heat almost suffocated the firemen who handled the nozzles in relays, being able to work for only a minute or two at a time. Although horses, carriages, harness and other equipment were saved earlier by the neighbors and by servants on the Wright estate, the stable, a building which had been remarkable for its architectural beauty, was a total loss, with a value of about $50,000 placed on it. Most tragic of all was the death of Mr. and Mrs. James Stewart, employees of the Wrights, who lived in the second floor apartment of the stable. The picture of the ruins of the once beautiful building is a remarkable one in the clarity and sharpness of its detail.